AllBirds&Co Suet Balls help feed birds during the winter months. It is hard for birds to find food during these months and with these suet balls, you can give birds a helping hand! It is hard for birds to find food during the winter months. Especially during these winter months a bird needs extra energy to keep his/her body temperature at the right level. With AllBirds&Co Suet Balls, you can give birds a helping hand. These suet balls contain various types of grains and fruit and can be hung in your garden. In addition to these functional features, it is also fun to watch birds eating from your living room on a nice, cold winter day. The suet balls can also be placed in a suet ball holder , which we offer here . 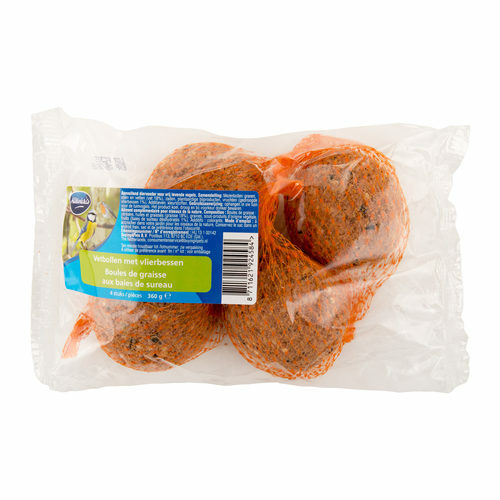 One package of AllBirds&Co Elderberry Suet Balls Bird Food contains 4 balls of 90 grams each. Have you used AllBirds&Co Elderberry Suet Balls Bird Food before? Let us know what you think about this product.